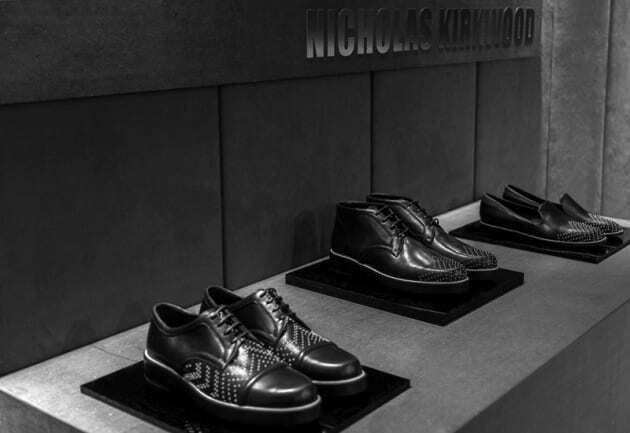 British footwear designer Nicholas Kirkwood introduces Nicholas Kirkwood Men’s as part of London Collections: Man. Kirkwood who studied at Central St. Martins and Cordwainers College originally started his shoe design career hand making men’s shoes for himself as well as special orders for clients. The now 32-year-old British designer Kirkwood who launched his eponymous luxury women’s footwear label in spring 2005 extends his offering of architecturally inspired pieces to men. Craftsmanship plays an integral role in Kirkwood’s men’s collection highlighted by the use of geometric forms, as well as a considered attention to line, proportion, and intricate detailing. All of Nicholas Kirkwood shoes are 100% handcrafted in Italy and made of the highest-grade materials available, often utilizing innovative techniques to develop custom-made leathers and fabrics. The new collection comprises of 6 main styles, released in 21 variations. The collection will be available at Nicholas Kirkwood Boutiques in London and New York and select retailers worldwide as well as online from July 2013. The collection will range from $520 to $950. Click through the 1st collection of the recently named accessories designer of the year at the British Fashion Awards 2012. Nicholas Kirkwood Launches Luxury Men’s Shoe Line is a post by Georgia Reeve on Highsnobiety.